When The Remix and I decided to head to Ottawa for our anniversary, I knew that I'd have to do a special mani. And since we'd just finished our May Flowers theme week, and we got married in tropical St. Lucia, I was inspired to keep the theme going. To start, I did two coats of Paper Mache. Now, I have to say that since FingerPaints changed their bottles, I've suspected they altered their polish formula as well. There used to be a time where one coat could get awesome coverage, but now I'm finding that even two coats can be a bit streaky. Needless to say, it's pretty much the worst thing ever. Haha! So if you know of any other white polishes that go on streak-free, I'd love to hear about them! 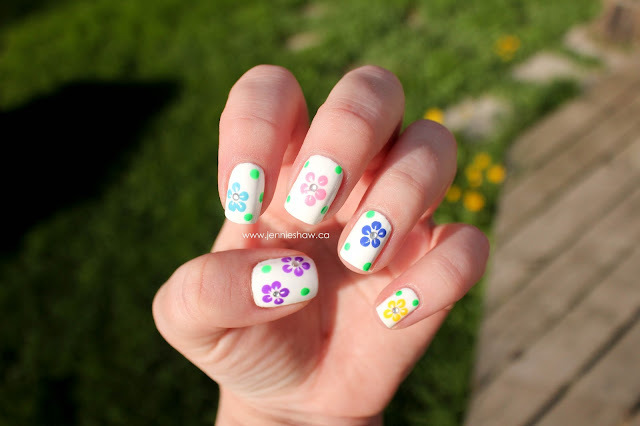 Anyway, when the base coats were fully dried, I picked up a medium dotting tool and got to work, putting a differently-coloured flower on each finger. 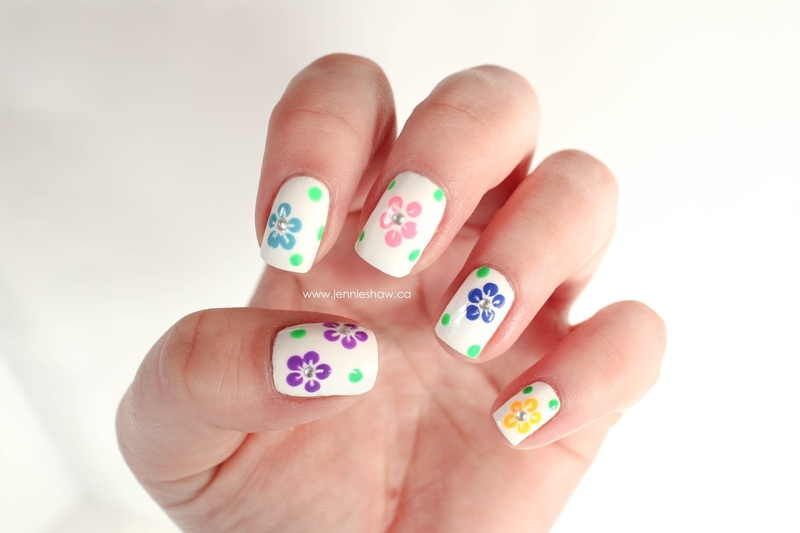 I went one nail at a time, and used a toothpick to create little lines in the middle of each petal. This was why having a completely dry base coat was so important. If the white wasn't dry, I could've scraped off the base with the toothpick. Originally, I was going to add some leaves, to make the flowers seem more tropical-ish, but couldn't figure out where to put them, so I just added green dots for a similar effect. 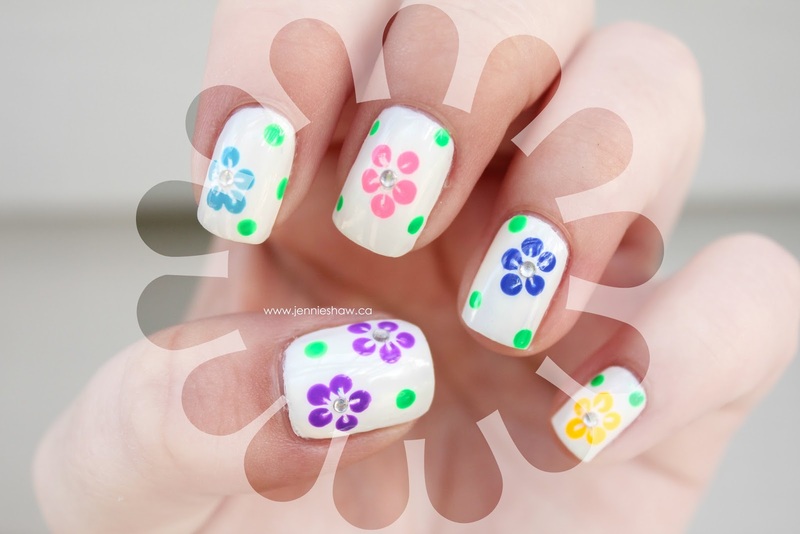 And then, for some sparkle, I put one clear gem in the middle of each flower, finishing it all with quick-dry top coat. I freaking love this mani, guys. It's so fun! And the green dots work pretty well as abstract leaves. Or, at least I think they do. Haha! And dragging a toothpick through the centre of each petal really created a different look. One that was perfect for our anniversary! What were you rocking this week? Link up and show off! Now that is lovely! I've had good luck with Butter London's Cotton Buds, which I'm wearing this week. I can't get over your talent, friend! So so good! And happy anniversary!! First off, that's awesome and it sounds easy and why did I never think to drag a toothpick through to create that crease?!?! Totally putting this on my never-ending "manis to do" list. I wish I could do flowers. I'm not very good at them. Happy Anniversary. Ours is tomorrow. Can you believe June is next week? That stinks that finger paint change this formula up. I have been rocking pink nails with glitter on for 2 weeks now. Neon month sounds like fun. I have 2 neon polish's. I will former us next month. why won't squirrels stop ruining my life?